This entry was posted on Thursday, July 1st, 2010 at 2:56 pm	and is filed under Uncategorized. You can follow any responses to this entry through the RSS 2.0 feed. You can leave a response, or trackback from your own site. 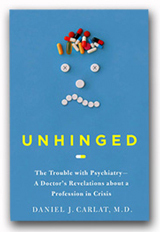 Thought you’d like to know I wrote a book review on “Unhinged,” and linked to several your blogs. Check it out if you like, and feel free to link to it! Thanks for the good info and an honest perspective.